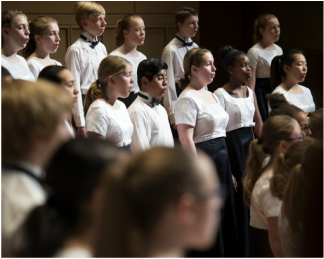 ​Led by Cynthia Nott, CCGD's Concert I Chorus is CCGD's most advanced children's chorus. This chorus rehearses on Monday evenings from 7:00 - 8:45 p.m. and approximately one Saturday morning or afternoon each month at Lovers Lane United Methodist Church, 9200 Inwood Road. The performance schedule for this chorus is the most extensive and can be as often as once a month. This chorus performs with the Dallas Symphony Orchestra annually, often multiple times each season. The commitment to this chorus is extensive; singers who are placed in this chorus may request placement in a chorus with a lighter performing schedule. Tuition is $695 per year.